Jody Zellen is an artist living in Los Angeles, California. She works in many media simultaneously, making photographs, installations, net art, public art, and artists’ books that explore the subject of the urban environment. Recent exhibitions include: Futuresonic 04, Manchester; Images Festival, Toronto, 2004; Downtown Digital, Pace Digital Gallery, New York, 2003; Day Job, New Langton Arts, San Francisco, 2002; the Bienal de São Paulo Paulo, 2002; Urban Festival, Zagreb, 2002; FILE:2001 Electronic Language International Festival; Artfuture2000, Taipei; International Biennial of Architecture, Florence; and Net_Condition, ZKM, 1999. Her web site, Ghost City (http://www.ghostcity.com), begun in 1997, is an ever-changing, poetic meditation on the city. In addition to Ghost City, her other web projects include Random Paths (http://www.randompaths.com) and Visual Chaos (http://www.visualchaos.org). A recent project, Crowds and Power, was the October 2002 portal for the Whitney Museum’s artport. Disembodied Voices, her latest project, is a meditation on the nature of public space. 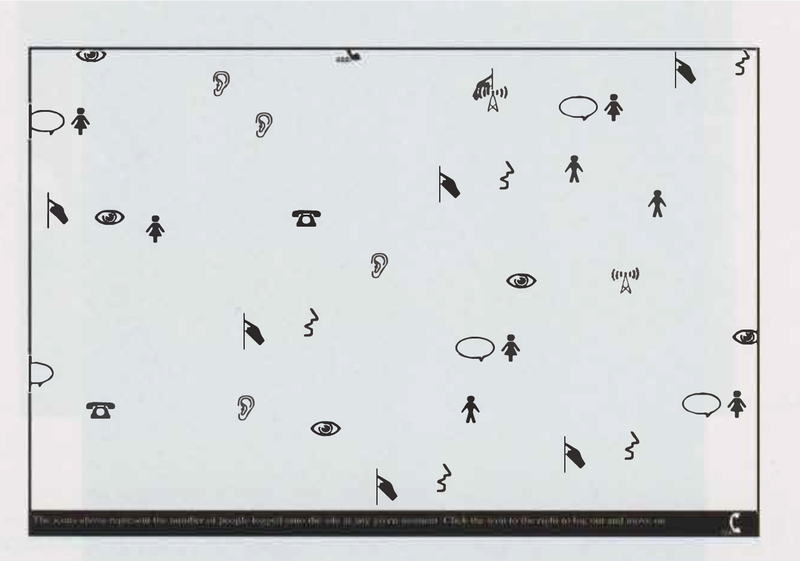 It is a visual representation of how different bodies communicate across space, using cell phones as a metaphor for the new translocal of connected, disembodied voices, linked across space invisibly – forming an unseen network of wanderers, always within reach yet nowhere in sight. We now have private conversa­tions in public, and in so doing, these conversations, or at least half of them, become public events, a half-dialogue that no longer knows such a thing as privacy. As the line between public and private con­tinues to blur, intimate transactions have become audible to anyone within earshot. Where we are, in a sense, no longer matters, since we are always connected. This site illustrates the collision of the personal/private and public space. Cell-phone users, increasingly oblivious to their surroundings, remain undaunted by the fact that to anyone nearby, they appear to be carrying on animated monologues, stopping, gesturing, and often yelling into empty space, behaving similarly to the street person who they surely would go out of their way to avoid. With the introduction of new technologies into the urban environment, the lines between the sane and the insane are becoming blurred, as we all participate in conversations with invisible friends who no one can see or hear, adding to the chaos, confusion, and intricacy of life in the city.